The newest restaurant to open within the Trafford Centre’s The Orient is Japanese noodle expert Wagamama. Opening their doors to the public on Monday 12th October, Wagamama are excited about the launch of their biggest restaurant to date and I was fortunate enough to be invited to a special preview event. I’ve never been to Wagamama before (I know, shocking) and it was a taste sensation! Executive Chef Steve and his team demonstrated both a short rib and a seafood Ramen dish which are new to the Wagamama menu. Don’t worry though, the much-loved Katsu Curry and the spicy Firecracker are still firmly on the menu. The slow cooked rib is brought in and then added to a deeply flavoured soup with noodles and garnished with fresh and flavoursome ingredients, creating a truly melt-in-the-mouth experience. 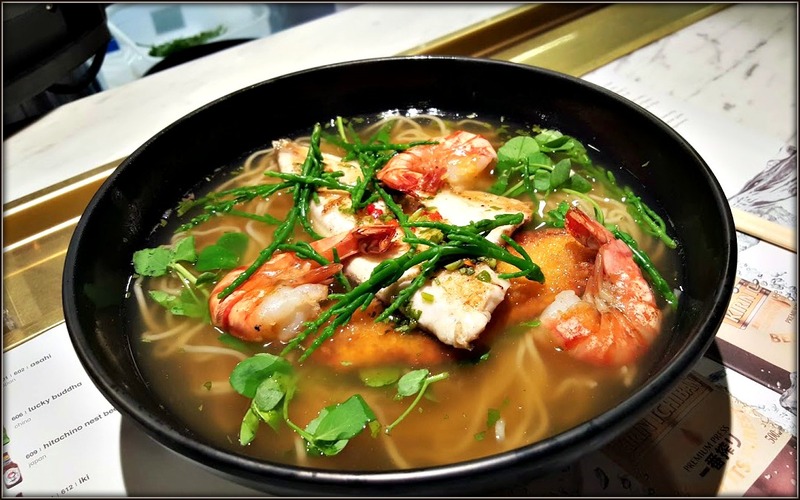 The seafood is freshly cooked to order and is garnished with a handful of Samphire to really bring the taste of the sea to the middle of the Trafford Centre. The rapport in the kitchen seems great at Wagamama, and with up to 16 members of the team in there during a busy period it’s a good job! There’s a great team spirit and the staff look happy and are helpful. The children’s menu looks great too, offering a good selection of meals for younger visitors. It’s always refreshing for me to see something more than a choice between burgers or fish fingers when dining out with the kids, and Wagamama have got their kids menu spot on. In true Wagamama style, the layout of the restaurant is designed around the central open kitchen allowing diners to see their food being freshly prepared. There is a choice of seating too, as Wagamama have added breakout areas and booths to their traditional setting of long tables and canteen style stools. The drinks aren’t exactly standard either with some brilliant fresh juices available. I recommend the Clean Green – very refreshing and it tastes great too. The new restaurant has created 115 jobs for local people and boasts 295 covers. Bookings can be taken for larger groups on 0161 641 1971 or you can find your nearest branch on the Wagamama website.